Nativity: Applicant should be an Indian citizen. However, only those candidates who are of Kerala origin are eligible for any type of reservation or any fee concession. Academic qualifications: Candidates who have passed the L.L.B. 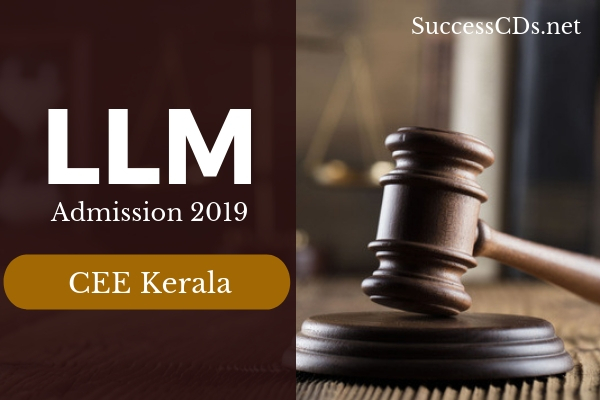 examination (5 year / 3 year course) with a minimum of 50% marks from the Universities in Kerala or other Universities recognized by the Universities in Kerala as equivalent thereto are eligible for admission. Candidates appearing / appeared for the regular Final year LL.B. examination can also apply for the Entrance Examination. Such candidates become eligible for admission only if they produce the Provisional / Degree Certificate of the qualifying examination and the mark lists of all parts of the qualifying examination at the time of admission. Age: There is no upper age limit for admission to the LL.M Course. Entrance Examination: The Online Entrance Examination (Computer Based Test) will be conducted at Thiruvananthapuram, on 10.03.2019 (Sunday). There will be two parts of a total of 3 hours duration. Each part will consist of 100 Objective Type questions. The questions will be of the standard of LL.B Examination. The date for CAP will be notified on the website and in leading newspapers; individual intimation in this regard will not be sent to candidates. Entrance Exam and subsequent allotments will be based on the provisions laid down in the Prospectus for Admission to LLM Course 2019, approved by Govt. Candidate can remit the application fee either by selecting the online payment option/e-challan; they can use net banking/debit card/credit card for online payment.